Reports indicate 150,000 people in 620 villages of Lorestan are lacking even drinking water. A regime official in the city of Khorramabad, capital of Lorestan Province, said 120 local villages lack drinking water. Floodwaters in the Province have caused severe damages to many rural and urban areas, most of which has been witnessed in the worst hit city of Pol Dokhtar. A member of Iranian parliament reported from Pol Dokhtar that many people “have spent two nights in the open, having fled to the mountains and have nothing”, Fars news agency quoted Hamidreza Kazemi as saying. The lawmaker appealed to government and organizations to send food and warm cloths to the area. Kazemi reported that 60 villages in Lorestan are under flood water and cut-off from the outside world. Also, half of Pol Dokhtar and Mamulan and 20 adjacent villages are also under water. Mahmoud Sadeghi, an MP from Tehran said that the conditions in Lorestan “were on the verge of a disaster” in a tweet addressed to Iran’s president Rouhani. “Mr. Rouhani! Lorestan is on the verge of a disaster. Pol Dokhtar has slumped into mud. The basic needs of the people including food, water and medicine have not been provided. Disorder and lack of planning is extensive. Organizing this situation needs national management and a large budget. The situation will not be managed with weak provincial management and donations,” he tweeted today. The Representative of Pol Dokhtar in Iran’s parliament told the state-run Fars News Agency that “a number of flood stricken locals have been living in open fields for two days”. “There are a number of people who have spent two nights in open fields and have taken refuge in the mountains. They have nothing and the helicopters that go in those areas only give them a few packages of food,” Hamdireza Kazemi said. He said that the people needed urgent aid in the form of water, food, tents and supplies for warmth adding that under current circumstances, “these relief supplies cannot be sent to them”. The MP said that the number of helicopters were limited and could not provide adequate relief adding that roads had to be opened. “The Route and Transportation Department has started establishing ground routes, but due to limited facilities, some provinces and ministries must take measures and come to the aid of the people,” Kazemi said in an open criticism of lack of government aid. “Sixty villages are facing flood conditions and have no commutation routes with anywhere in Iran. The people in the town have no food, clothes and supplies. Half of the towns of Poldokhtar and (neighboring) Mamulan and around 20 villages are under water,” he added. People in flood hit cities, town and villages across Iran are complaining of regime authorities failing to provide any aid for the tens of thousands in desperate need. Eyewitnesses say hundreds were killed in Lorestan because helicopters came too late and families who had taken refuge on rooftops for two days without aid were swept away. 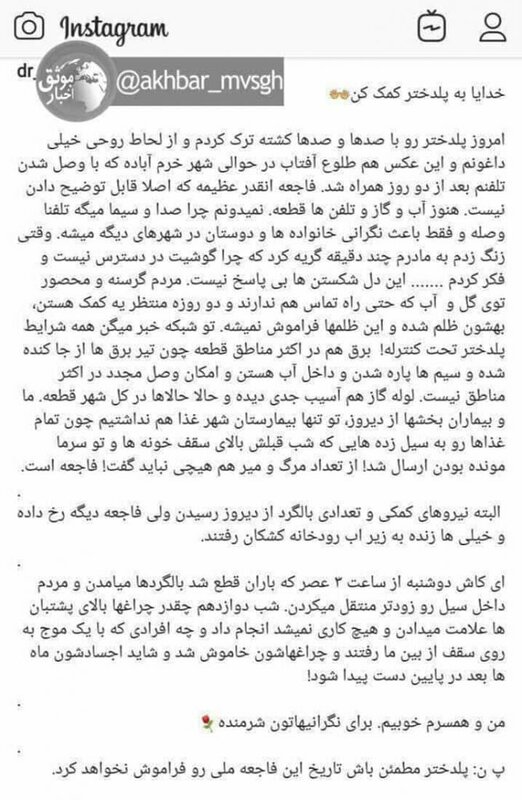 According to an Instagram post published by a doctor who works in a local hospital in Pol Dokhtar, “hundreds and hundreds” of people lost their lives in Pol Dokhtar. “Today I left Pol Dokhtar with hundreds and hundreds of fatalities and I’m very distraught”, he wrote adding that the scope of the “disaster was so extreme that it could not be explained”. “The people, hungry and surrounded by water and mud, who have lost communications with the outside and have been waiting for two days for help have been oppressed and this oppression will not be left unanswered,” the doctor wrote. He said that Iran’s state-run TV announced that “everything was under control” in Pol Dokhtar while there was no power and gas in many parts of the town. He wrote that the reason so many people died was because helicopters came too late to pick up those who were stranded on their rooftops. “I wish that the helicopters would have come on Monday at 3 pm when the rain stopped to transfer the people who were stranded. On the night of the 1st of April, many people were on their rooftops signaling with lights but there was nothing that we could do and many people were swept away from their roofs and their lights went out. Their bodies might be found months from now”, he wrote in a shocking description of the consequences of the regime’s negligence in relief efforts. State media however, announced that the death toll from major floods has reached to 66. 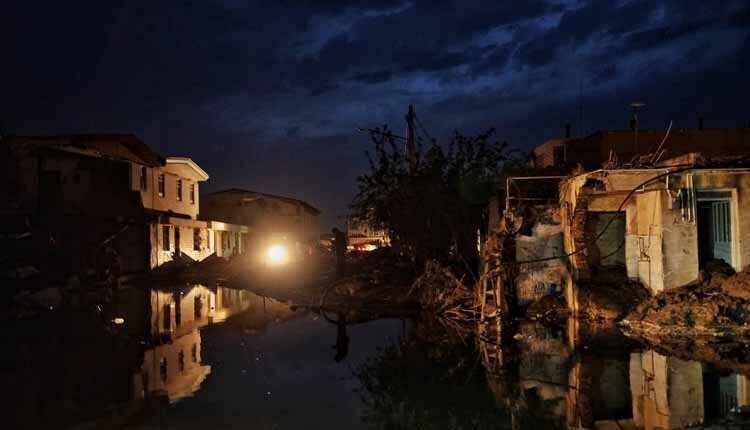 Iran has been facing major flooding whih was first began in the second half of March and have struck hundreds of villages as well as towns and cities in north and west of the country, where in some places a state of emergency has been declared.